Spike Sedge Grass For Sale - Lowest Prices Online Today! Spike Sedge makes it popular for use in landscaping. As one of many sedge species, Spike Sedge is so named due to the spiky flowers it produces. This plant will grow from two to three feet high and is less than a foot in width. Spike Sedge grows well in areas where it receives partial shade, but it will tolerate full sun. This is a plant that will do well in water gardens, around lakes or ponds, and even in dry areas such as near cliffs. It is low-maintenance and will come back each year. It takes only a year for it to reach full maturity. A perennial, Spike Sedge has flowers that are spiky in appearance. The flowers appear in groups in single spots on the stem. They are typically a light yellow or brown. The green leaves of the plant are from one to three feet long, and they are thin. They are similar to regular blades of grass. Spike Sedge grows in soil that is sandy, dry, or soil that is slightly acidic. The plant will grow in several areas of the country from Massachusetts to Florida and Texas as well as the coastal plains. It is particularly plentiful in Canada and across the northwestern US. Spike Sedge is a hardy plant and can survive in a variety of environments. This is a unisexual species of plant. This means the plant contains both male and female flowers. The male flowers are at the top, and female flowers are just under the males. Blooming in July and August, the Spike Sedge is also a fruit-bearing plant. Around the pistol, there is a perigynium that produces a nut with one seed. Because Spike Sedge has deep-seeding roots, this plant can help stop soil erosion. It is often used instead of traditional grass. It can also be used to provide livestock with a food source. Spike Sedge grow in wetlands and Arctic and alpine (high mountain) tundra. The majority of garden sedges thrive in moist shade, an environment where grass does not do well. Sedges can thus provide the open, airy, vertical look of ornamental grasses in shade plantings. Plant breeders have created varieties with new growth habits, leaf colors, and markings. Native sedges go well in natural landscape plantings. Sedges can make excellent container plants for patios and terraces. Spike Sedge is native to the mountainous areas of the western US and Pacific Northwest, Alaska, and Canada in hardiness zones 2 to 6. Unlike most other sedges, it prefers sun and dry sandy soil. It grows naturally in areas with limestone outcroppings, making it suitable for rock gardens with limestone ledge or boulders. It prefers rich soil (pH > 7.2). It grows 1 to 3 feet tall with fibrous roots. In hot areas, it may go dormant during the summer. Spike Sedge are easy to maintain. 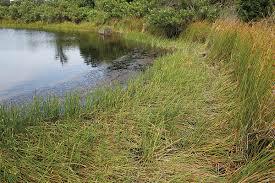 Sedges are easy to maintain as long as they have enough water. They seldom need fertilizer. Deer and rabbits leave them alone, and they have few pests or diseases. When plants look tattered, they can be cut back by about 1/3. Divide if the center starts to die out. Seeds or division can propagate sedges.